Dolores Kirkwood has had a significant influence on my life since I was four years old. She was my first serious ballet teacher, and has been a mentor to me for most of my life. The legacy she has created is astounding; she has a background as a professional dancer and “musical theatre star” (Freshvancouver.com), she is the co- founder of both the Royal City Youth Ballet Company and the Royal City Musical Theatre Company, she has been teaching since the age of eighteen, has won countless awards, such as “New Westminster’s Citizen of the Year…the Sam Payne Award…[inclusion in] British Columbia’s Entertainment Hall of Fame [with her own star on Vancouver’s Granville Street]” (Dolores Kirkwood: Life Registered Teacher), and was most recently honoured with the Order of BC in 2009 (Freshvancouver.com). Many of her students have gone on to dance and choreograph professionally all over the world, and she is admired and respected by the dance community. On the afternoon of February 10th, 2015, I visited Ms. Kirkwood in her New Westminster apartment. We sat down at her lace-covered dining room table, to have tea and talk about her impactful life, and I gained insights about family, respect, honesty, and passing down a passion for the arts. 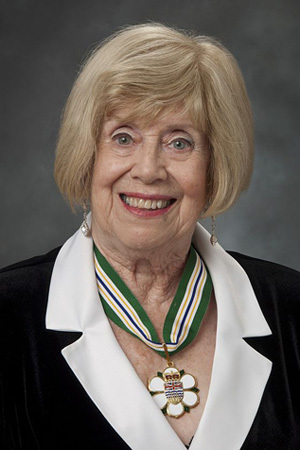 2009 Recipient: Dolores Kirkwood – New Westminster: Order of BC, 2009. Courtesy of the Government of BC. IF: How were you inspired to pursue performing as a profession? DK: Oh that goes back a lot of years. My parents loved to dance, I come from a musical family, from the east…my grandfather was a concert violinist and my grandmother played the piano for him, and so it was never a decision; it had to be…I started dancing on 3rd avenue in New Westminster with Josephine Slater who was, as I look back, a very inventive, determined teacher. And I can remember, age four was when I started, and there were chestnut trees all along 3rd avenue…and I danced all the way to my dance class. [Ms. Slater taught in] an old home – huge, old family home. And the living room/dining room, I loved going in there because it had painted glass in the windows and everything. And what was your first professional performing experience? Oh, professional, um, I guess that was probably Theatre Under The Stars in Vancouver. I auditioned, and the choreographer said “I like you, but I want to see you next week and I want your legs another foot higher; I want a high arabesque,” so I worked and stretched all week and she said, “I can’t believe you’re the same person; you need to practice more often!” [she laughs at the memory] and that season I did Little Mary Sunshine, Gypsy. In Little Mary Sunshine, I was in the cast and then for Gypsy, I was understudying Helena Bliss who was a very famous New York [performer]. In those days, TUTS was a professional company. And I remember that season, Miss Bliss had to take a night off and I had to go on, and I remember coming off the stage and the stage manager said “That went really well,” and I said “I can’t remember what I did; did I forget any lines?” And then the famous Sam Payne, who brought professional theatre to Vancouver…he was there when I said, “It was just automatic, was it too terrible?” and he sat me down between scenes to have a little chat with me about being on a stage when you’re afraid and I said, “No, I wasn’t afraid, I was just worried that I’d done it right!” So I’ll always remember Sam Payne for his words of encouragement. So that was my first…then there were touring shows that came to Vancouver. And I was always very proud of the fact that whatever I auditioned for, I got, so I did a lot of shows. And Vancouver used to have what they called the Vancouver Festival, and I did all of those, they were on for about five or six years, and even today I still run into people that have continued on in the profession, and we remember the days of our theatre experiences in Vancouver and how much we learned by it. Although we were professionals, we had a lot to learn…great experiences. And when I went on tours, that was even more fun, because each theatre was different, but it was the same. Every theatre in the world, you should be able to find your way around when you’re a professional. And I went to my singing teacher, Avis Phillips, who taught all the biggies that came out of Vancouver and went on with opera, and…when I first went to her she didn’t want to see me, because she didn’t have time, and then I coaxed her and said “Well will you just see me and tell me what I need to do?” She was very elderly and she looked like she could be cranky [we both laugh] but she wasn’t, but I sang about a line of a song and then she got a hold of me and she was pushing up my chin, and my ribs, [she starts re- enacting the scene] pushing them back into my back, and she was pushing and shoving and she said, “Ok, next [time], I want you to do this before your next lesson,” and I said, “There’s going to be a next lesson? !” And she said, “Oh yes, I could help you a lot, you would be a challenge for me. I would like to work with you.” So on the way home I thought “Well I’ll do all these things and then I’ll have to go back for one more lesson but I don’t think I could handle it,” because it was all classical music and I loved musical theatre by that point. So I got back and she let me sing! And she said “Yes, yes, yes, that’s it, now a little more of this and a little more of that.” By the time I left I thought, “Oh yes, this is what I want to do as well as dance,” I just decided that one day when I got too old to dance I’d be able to sing. So that was sort of briefly the outline. I loved the touring shows because I met so many wonderful performers. A lot of New York people came to Vancouver to be, for instance, in TUTS and then they got jobs or the show continued on and I would go with them. One of the wonderful touring shows that I did, Sweet Charity, [was an] all New York cast except Norbert Vesak…he was a Port Moody boy; he danced in the Coquitlam festival and then my teacher went to him and said “You need help, I’ll look after you.” So anyway, Norbert and I were with all these New Yorkers…That was a lovely experience, and I had a minor role, but I had an acting scene with Chita Rivera, who performed that same show on Broadway and in London, so every chance I got I watched what she did and how she did it, and that was a fabulous experience. Yes…at one point, I did something stupid on stage, and she reported me – and she had every right to – and I was sent to her dressing room. So I went in and I apologized and she said, “Why would you do that?” and I said, “Chita, I watch everything that you do, I think you’re so wonderful, and I just, I’m afraid of you, because you’re just so much more than I’ve ever experienced.” So she laughed then and said, “You know, my name is really Dolores also,” so she said, “Now, we’ll be friends.” And we were friends; I got in touch with her when she opened another show on Broadway. But, she was a big one, and I learned not to mess around onstage. And even now when I choreograph a show, I usually warn the kids ahead that there’s no messing around. It’s not cute and it’s disturbing and it’s unprofessional. So once I get that off my chest, nobody ever breaks the rules. I think everybody does it once, until they realize what a stupid thing it was to do. I would have never done anything to hurt anyone, but it threw her. Author unknown. 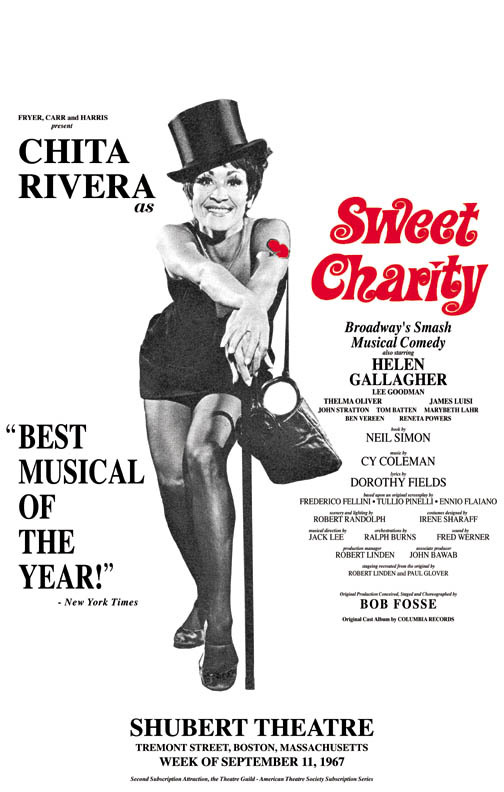 Chita Rivera as Sweet Charity, 1967. Poster. 14 × 22 in. So, Robert Weede [and Jerry Orbach and] I did The Most Happy Fella – [Weede] was a famous opera singer. I had a little story from then: Pam, my daughter – I think she was six – she was the little girl in the show, and the director, a New York director again, said “Pam, you need to move around so Mr. Weede’s face is facing…it doesn’t matter where you’re facing, but he must be facing front.” And she looked at this director and she said “But he keeps upstaging me!” [we both laugh] and I remember the lead actor said “My god, I didn’t know what upstaging was until I was 25 years old!” but this six year old knew! So that was one of the fun stories. My son, Kirk, was in Oliver and he, when they sang “Pile peaches and cream about six feet high,” on the “high” his voice seemed to need clearing and the musical director came to me and said “I’m going to have to replace him within a week. We’ll keep him in the show,” because we were on tour, “but his voice is about to crack,” and I said, “Oh no, it must be a cold, he’s only 12,” he said, “He’s old enough, and it is changing.” And he was right, by the end of the week another boy had to sing that part of the song. So we had a lot of laughs about making adjustments when you’re doing a show. The role of Dolly Levi in “Hello Dolly” is probably your most iconic performance, in the opinion of this community, but what would you say is your own most memorable role or experience during your performing career? Probably Gypsy, because I wasn’t really Mama Rose; I had to really work at it. Dolly was me [she chuckles] but Gypsy was not me. But I was what they had cast. So that was a wonderful experience, because her mother was a really hard, hard woman. Years before, I worked with Gypsy Rose Lee herself, in a nightclub show at the Cave Supper Club in Vancouver. And…we [the dancers] backed every show, so that like when the Mills Brothers came in, we would do the big opening number and then they would come in and then we’d do the final number. And when Gypsy Rose came in…she was Gypsy Rose and we liked her fine…then we did our first rehearsal with her, and then she came slamming into the dressing room and said, “I didn’t think you’d be so good.” So what she used to do when she – she never ever stripped, even though she was booked as a stripper, but there was a cloth box around her [with] the lights shining, and she would take pins out of her costume. Well, what she usually did was toss the pins into the band – they used to get annoyed when it went down the bass trumpet or something – but the next time we danced our number…we danced in bare feet, and she threw those pins all over the stage. And she didn’t have to say any more, I mean it wasn’t a mistake; [the pins] were all over, so it was like porcupine quills when we came out. And I was the spokesman for the girls – there were six of us – and I said, “We shouldn’t have to put up with that…so maybe we should take a week off.” And [the manager] said, “You know what, I agree with you. It would be easier on all of us if you’d just take the week off.” So, you know, I mean we welcomed a week…but that is the only time ever that I remember being with someone that didn’t work as part of the team; I was always very fortunate, or with good people or something. Vancouver Province. Dolores Kirkwood, in Hello Dolly, Malcolm Bowl, 1971. Published in a newspaper, 8 × 7 1⁄2 in. And why did you turn to teaching at such an early age? Because I got married, which was no problem, but we were buying a house and so I continued some shows, but I needed to make some money to buy our home. And I never really stopped teaching once I had started. One neighbour girl when I was, oh I guess nine or ten years old, decided that we were going to hold our own May Day in my backyard. And I decided that she would be the new May Queen, because that way I would be the old May Queen and I would be able to put the crown on her head; that was the part [of passing on a legacy] that kind of appealed to me. When I was a teenager, my mother was alone and couldn’t afford my dance lessons, and so Ms. Slater said “I need some help in the studio,” so I went and helped at the studio, so that’s what my beginning was. And then, there used to be two car loads of kids came from Hammond…part of Maple Ridge, and they wondered if she could send me out there instead of the fifteen of them coming into New Westminster. So she thought that was a wonderful idea, so I went there on Saturdays by bus…to Port Coquitlam, and I had coffee with the bus driver, and then we went on towards Haney, Maple Ridge, and I got off on the highway, packing my record player and records and books, and walked two miles into this Anglican church hall where I taught. I was fourteen, then. And then…I was sixteen when Charlotte Holt, a young teacher from Port Coquitlam, was getting married and moving to California. So, she asked if I would take over her school – she had twenty-five students, which is a fair amount to get through in a day. So, I went out and taught there after school Friday, and then stayed overnight and taught in Haney the next [day] on Saturday, and came home exhausted on Saturday night. So that’s what started me teaching. And I remember that you taught in Nanaimo…or did you just have students that came from Nanaimo? Oh…my son died in a car accident, and that was in August, and a lady [from Nanaimo] phoned at the end of September, not knowing any of this, [saying that] their teacher was quite ill and they wanted to get ready for the festival, so would I come over on Fridays and teach the students there. And my husband and I decided that that would be a good thing for me, you know to get active with people who weren’t aware of the situation. And so I started on Fridays, and I hated it. I used to get on the ferry crying after every Friday, and I thought “I’m glad it’s all done at Christmas.” And then the woman who had been sick, who I had looked after everything for, said, “I’ve decided I don’t want to teach anymore, so it’s all yours!” and I thought, “Oh these kids don’t give a hoot about anything!” So the next week I was going to tell them, and it was as if they knew, because they were suddenly saying “I’ve got an idea for a new dance we could do for festival!” and “We’ll do this,” and they had it all organized and I thought “Oh well, I guess I can last until May…” And they did beautifully in the festival, and I think it was because I thought “I’m gonna teach you what this is all about, and then you’ll know that you really don’t have what it takes!”…but they did! They fought the battle! And then one of the mothers said that “You shouldn’t be teaching in this community centre” and so she said “The church is for sale,” this little church on [Townsite Rd]…there were four [mothers] that said that they would like to buy this church, and then we would clear out the church part and that would be a nice studio for me…and I got drawn in. And we spent many hours on our hands and knees peeling the linoleum off the floor, and it was a hardwood floor underneath. And it was a beautiful studio. It was just perfect. And so there I was for another…twenty years, I think. And Carolé [Martyn] and her husband came over from South Africa. She had contacted me and said that would I be interested in having her come to teach. She was a soloist with the CAPAB Company [and PACT Company] and Johannesburg. And so I said yes. They just didn’t want to raise their children in Africa, because they could see the road ahead. So I thought this would be a long ways away. And Lindsay, her husband, came over for something else, and we had coffee together, and I liked him so much; he had the most beautiful, honest eyes, so I said “Yes, when the time comes, we’ll work something out.” Well the time came, and they wanted to leave quickly, and I went to someone that I knew in the immigration department. And they were here within two months. You have a lot of students who’ve become quite successful, like Reid Anderson over in Germany, or Lesley Telford– but what did you notice in those students that helped you to guide them, the ones that went on to become professionals? Yes, Lesley came to me when I was at Douglas College, her and her sister Heather. They were totally different. I think Heather was also in…they were both in Les Grands Ballets Canadiens. I recently went to see a show…a highly advertised show, and I had to leave at intermission. I felt that they lacked the respect that if you’re going to be in the theatre you have to have a respect for the theatre and for your audience and for your co-performers, and I didn’t like what I was seeing that night, and…I left. I don’t think I’ve ever walked out on a show before in my life, but…oh what did I look for in [my students]…well, talent! Determination…Respect of their body and the other performers with them…I think that’s very important. To always be true to yourself – I found so often, when I was a young teacher, I would think “Oh, Sally could be a professional because she can do [difficult moves] and she can do all the steps and whatnot,” but there has to be an honesty, and yes one of [the dancers] may not have the turn-out that you need for ballet, for instance; they have to realize that it’s hard work. It’s always hard work. You have to love it. It has to be part of you. And just learning the challenging things is not what’s going to make a professional, whether it’s as a teacher or as a performer. There has to be that love and respect and ambition. As I say, even at three I knew that’s what I wanted to do, that’s what made me happy, and my theatre life has gotten me through many stresses in my life, but I always had that one thing that I could cling to…for instance, [after] the death of my son. But it takes the drive, the talent, the love of the theatre, of what you’re doing. I believe that every young person should dance, because it gives them a discipline and makes their mind work, because you have to think fast sometimes when you’re dancing – as you know! [we both chuckle] Yeah, that’s how I…[they] always [have to be] musical. I’ve seen kids that can give me a beautiful arabesque line and do all the steps, but they can’t dance to music. They just don’t hear it. I encourage playing an instrument of some sort. When you were with Royal City Youth Ballet (RCYB) and Royal City Musical Theatre (RCMT)…you were artistic director of both of them, is that right? No, I was the choreographer [of RCMT]; [the late] Ed Harrington was the director and I was the choreographer. And we were a team. Many times, he would say “That’s terrible, change it,” and I would want to hit him [she laughs] but then when I’d fix it I’d think, “Oh…he was right.” We were always – honesty is another thing that has to go with the theatre. 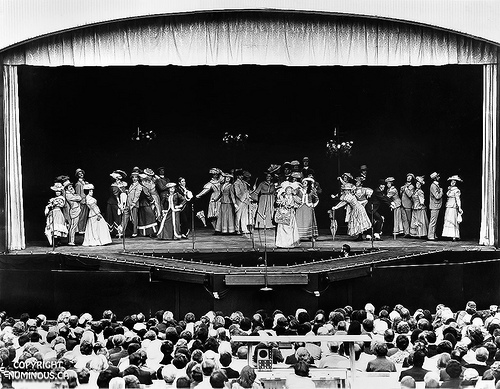 Royal City Musical Theatre – I was a founder, one of the founders; there were six. But the agreement was that I was the choreographer and Ed was the director. Then every so often, about every six, seven years, Ed would decide that “This is a show that we should do,” but he didn’t want to do it so it was up to me, and I figured, no, we were a team; we’d stay together and do the next show. [With the late] Lloyd Nicholson…he was a musician, but a wonderful musician and so therefore he directed very well, and Lloyd worked with Valerie [Easton], so there were sort of like two teams. Just before Ed died, the RCMT [named him] “Director Emeritus,” and I was named “Choreographer Emeritus,” which…it’s a forever title. And [with] RCYB, I was the director/choreographer, so um…actually, [speaking of] Leslie Telford, we thought let’s try a ballet and Leslie had all the qualities and so we did Coppélia, and we did it on the Massey Theatre stage, and it was after that that she went to Les Grands Ballets Canadiens. She was a lovely Coppélia. So after we had done Coppélia, it’s always on the list of all the shows we’ve done, but we really weren’t a company until after that. And then Mrs. [Donna] Fishwick and I sat down and said, “You know, if we’re going to do this, let’s make it a company and then we can build these kids up,” and there were several that I thought “There’s four of them that could be Sugar Plum Fairy, but we need to have a company that can make some money to pay for the costumes,” and all of those things, so it was… Coppélia was done at Christmas…yes, it was done I think around November, December. And then the next year, we did the first Nutcracker. And [my student] Camilla [Fishwick – now Kellogg] had danced in a Nutcracker from Seattle. She and [her sister] Keitha actually were both in it, so she knew all about it – Camilla’s such a bright girl – she knew every eyelash that moved [laughing] so, she helped me with the choreographing of the show, and then we went from there! So, did you have a preference to either role in either company? Did you enjoy working with RCMT more or RCYB, or how were they different? Yeah, that’s fun…and just going back to RCMT, [I don’t know] how many musical directors we’ve had, but again each of them bring something…bring their talents. When we had Lloyd [Nicholson], I remember he would stop and let me choreograph for a while and his head would get right down, and there were these piercing eyes, like he knew what he wanted to happen, and if it did happen he said “YES! Yes, that’s what you want them to do!” [she laughs] and I always said “You know, we’re in this together; if you see something should happen,” but he said, “But it usually does; we communicate.” And Ed [Harrington] was a wonderful director, because he could deal with anybody. So, Valerie [Easton], I’m happy to see that she has carried on. My son Kirk and Valerie were in [Theatre Under the Stars]; they were on the same stage many times, and knew each other from [a young] age, and also when we did shows at Metro Theatre. So, there’s two kids that grew up in the theatre. So when I called Valerie [to ask] if she might be available [as RCMT’s choreographer], and she was and I thought, you know, history…keeps going! So, having instructed dance for over 65 years now, how have you been able to keep or renew your passion for teaching? I don’t know, you’re still a pretty good demonstrator when you need to be. Oh yeah, yeah. But I’m not going to grand jeté across the floor! I can walk it and show where the arms go. I saw a film, you may have seen on TV. It was [about the former company members of the] Ballets Russes, like they’re old, old, old. And they were demonstrating to the ballet company and teaching, and it was so interesting, because they hardly moved from the waist down, but the hands [she makes a delicate, graceful gesture with her arms]…they would show “No, it doesn’t go there; this is…you’re a sylphide,” [it was] unreal. And all of these lovely gestures and I thought, “Oh, I wish the kids could see this,” because [the current dancers] from the company, from Ballets Russes, copied. But it was still their own, but they got the idea of those sylph-like hands that these dear old dancers had known and wanted to see kept. So…what was the question? Oh, just how have you been able to keep your passion? Oh, oh there’s always something new. Always. Everybody’s complaining about the Royal Academy [of Dance] and having all these changes [to the syllabus] and whatnot, but I have seen so many changes, and the dance has improved because of it. So, there’s always something more to add. And I like to think that I added some style too! [she laughs] And I’ve got…well I just don’t miss anything that comes to town. There’s always something more to add…Never stop learning. That’s the important thing. What is your focus, or do you have any specific principles or goals when you’re teaching young dancers? My goal, of course, is to…[she laughs] make them better dancers! But…music. If I had a class of three year olds, or a class of ten year olds, it would still be the music. And I said to somebody just recently, she was doing her practicing but she wasn’t dancing to the music, and I said “Do you put your music on when you dance?” and she said “Oh no, I don’t bother.” So we had a little talk about how dance is music and if you don’t let the music tell you [what to do], you’ll never dance. And to practice and dance without it…I was getting [from her] what you would get with no music. And that’s made me think…I’ve always said the music will talk to you if you listen to it. And instead of being “Step, point, step, hop,” [she says disjointedly] it’ll be “Step…point, step hop and,” [she sings in a lilting waltz] You hear it. Say the words and you’ll hear it in the music. I think I probably teach the same way I did except I know a little bit more! [she laughs] Experience does help a lot. I was thinking about…I was in a show and the song I was singing had like, I don’t know, fifteen verses or something, and I skipped a verse…well, afterwards I thought “Well that verse didn’t really matter,” but the conductor made a huge fuss about it, and I said “I didn’t do it purposely; it just happened!” and he said “So you made a fool of me.” And I said “No, you made a fool of yourself, because you knew I had skipped, didn’t you?” and he said “Yes, but my whole orchestra were there to play that verse,” and I said “Well, I didn’t do it purposely, but if you had been awake, you would have skipped with me!” But there again, that’s the thing, you listen to your music, and…it had too many verses anyway! [we laugh] I can’t remember what show it was, but I always remember I [skipped]…and the men in the orchestra knew! I think that was it, I think [the conductor] just went off in his Lala Land and they were going ahead with what I was singing! I think that’s it! That’s the end of the questions. Okay, now we’ll have tea then! “Dolores Kirkwood: Life Registered Teacher.” Royal Academy of Dance: Life Member. Royal Academy of Dance, 2009. Web. 28 Dec. 2015. <https://www.rad.org.uk/…/life- member-profile-dolores-kirkwood.pdf>. Freshvancouver.com. Web. 27 Jan. 2015. <http://freshvancouver.com/index.php?option=com_content&view=article&id=334:focus -on-women-dolores-kirkwood-artistic-director-royal-city-youth-ballet-company- &catid=50:lifestyle&Itemid=109>. The Georgia Straight. Vancouver Free Press, 10 Apr. 2014. Web. 27 Jan. 2015. <http://www.straight.com/arts/624656/royal-city-musical-theatre-celebrates-25-years&gt;. Order of BC RSS. 2009. Web. 29 Jan. 2015. <http://www.orderofbc.gov.bc.ca/members/obc-2009/2009-dolores-kirkwood/&gt;.